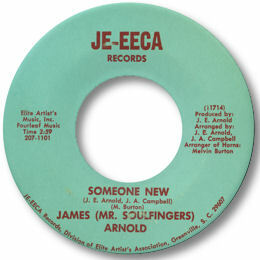 This South Carolina artist engagingly billed himself as “Mr Soulfingers” on this fine, if rather obscure single – the only one I know by the guy. The self-penned Someone New is a dead slow ballad of considerable merit on which Arnold is both lively and committed in his approach. The female chorus and small horn section are well arranged over a rhythm section in which the organist is particularly noteworthy. The bouncy “Your Chain Of Love” on the flip isn’t bad either.